Your college Christmas tree is going to add a lot to your dorm room decor for the holiday season. However, it won't add much if you just set it up without dorm room decorations on the branches! A bare Christmas tree may even detract a little bit from your dorm room decor if you set it up without some pretty dorm decorations. Plus your friends will have a lot of questions about why your dorm Christmas tree is hanging out in a corner of your college dorm room without any fun and pretty dorm decorations on the branches. Avoid answering those questions over and over again with our Tinsel Red Garland! 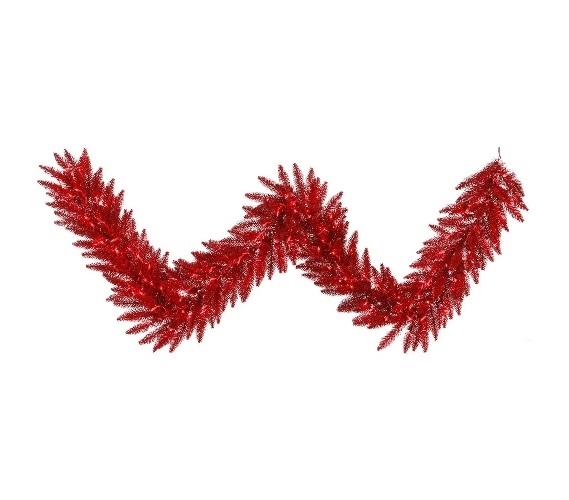 Our Tinsel Red Garland won't just prevent those awkward questions, it will impress and wow your friends. This dorm essentials item has a full look to the strands that will complete your dorm Christmas tree and create the nice full and decorated look your parents Christmas tree has. This dorm necessities item has shining tinsel highlights throughout the tips for extra impact in your dorm room decor. As if that wasn't enough already, this college supplies item has more! Wrapped through the garland strand are red mini dorm lights on red wire, allowing you to add two dorm essentials at once to your college dorm room decorations.